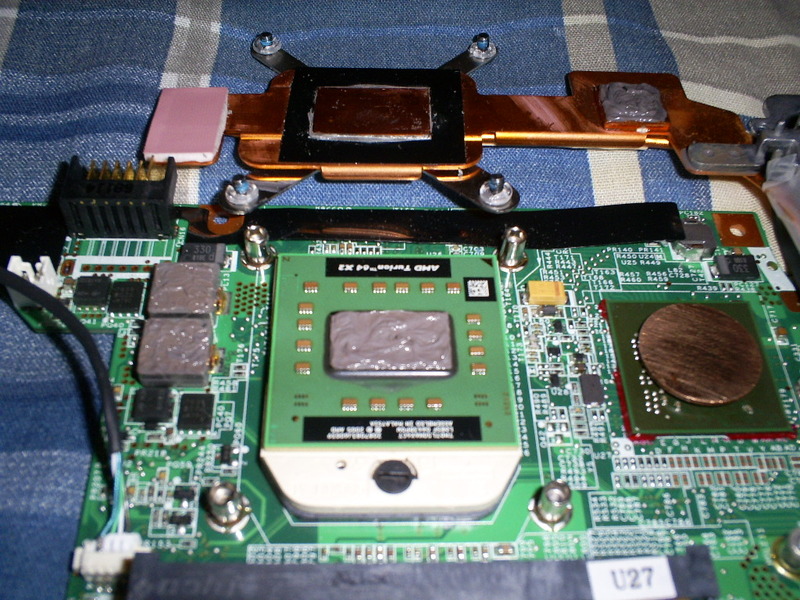 If your GPU is overheating, or failing because of bad solder balls, you may want to try the penny trick. 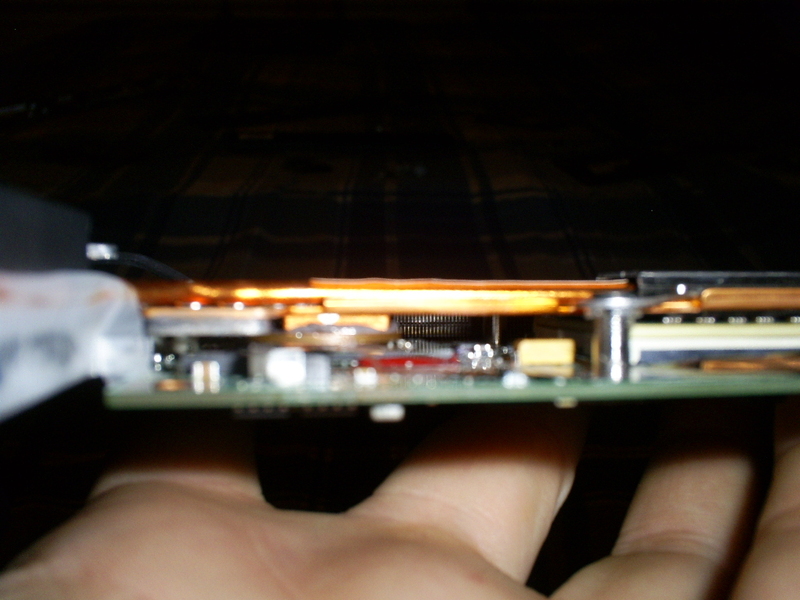 If it is failing because of bad solder balls, you might want to do the reflow trick first, then the penny trick. 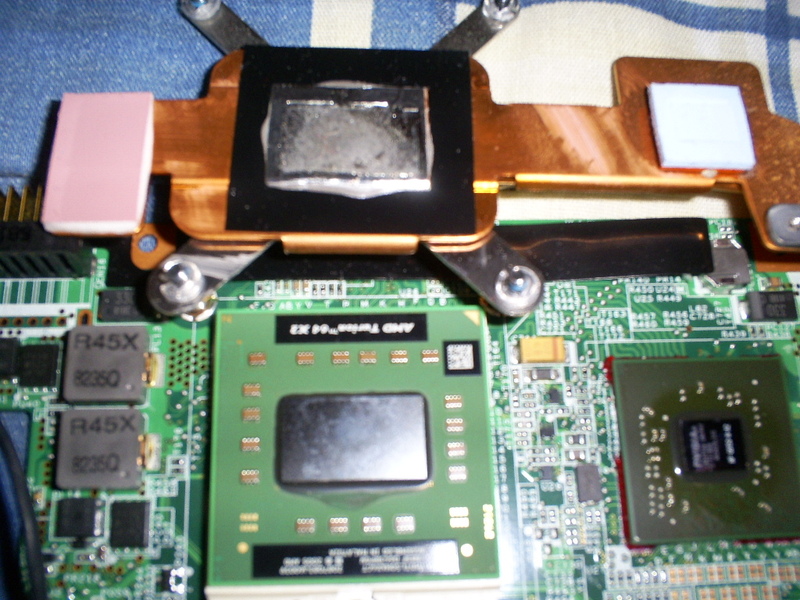 The penny helps conduct heat better than the rubber heat-sink pad, and also helps put preasure on the GPU to help with the solder ball problem. Here is the motherboard before anything is done to it. 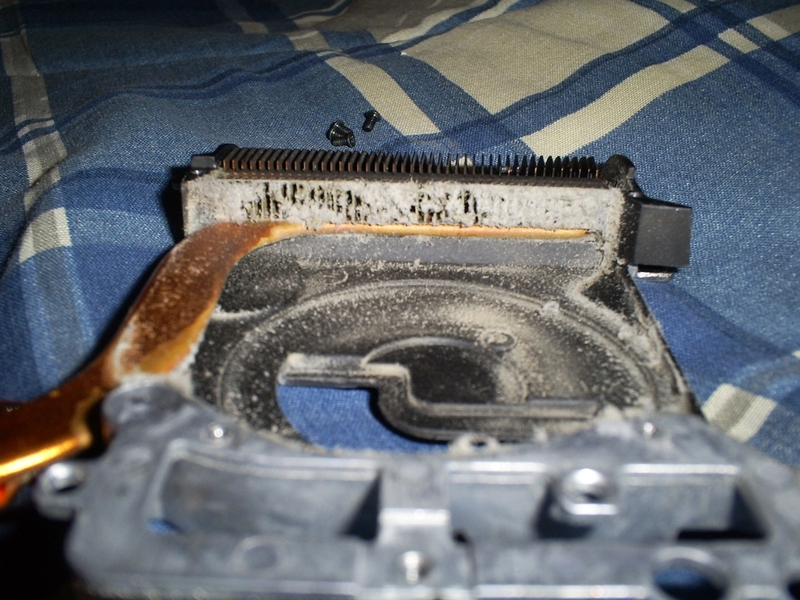 You can see a little bit of dust on the fan blades. 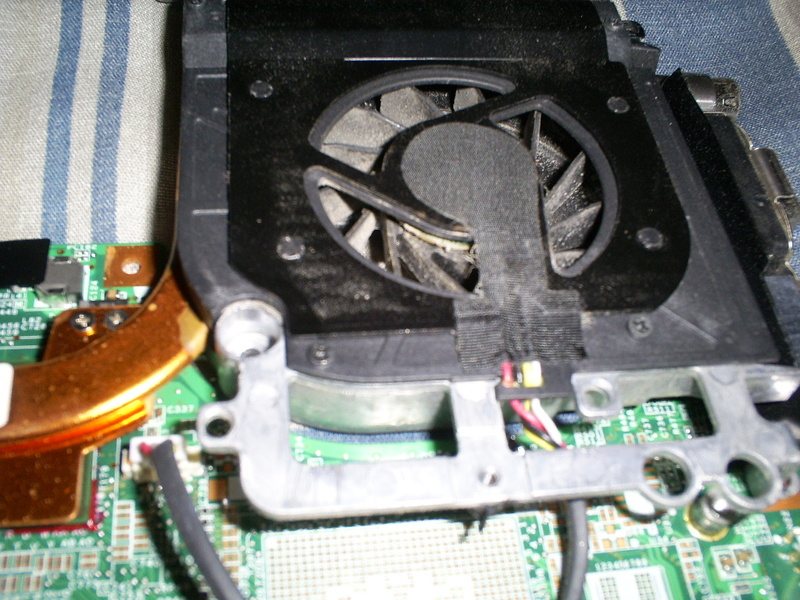 How much dust do you think there will be in the fan assembly? 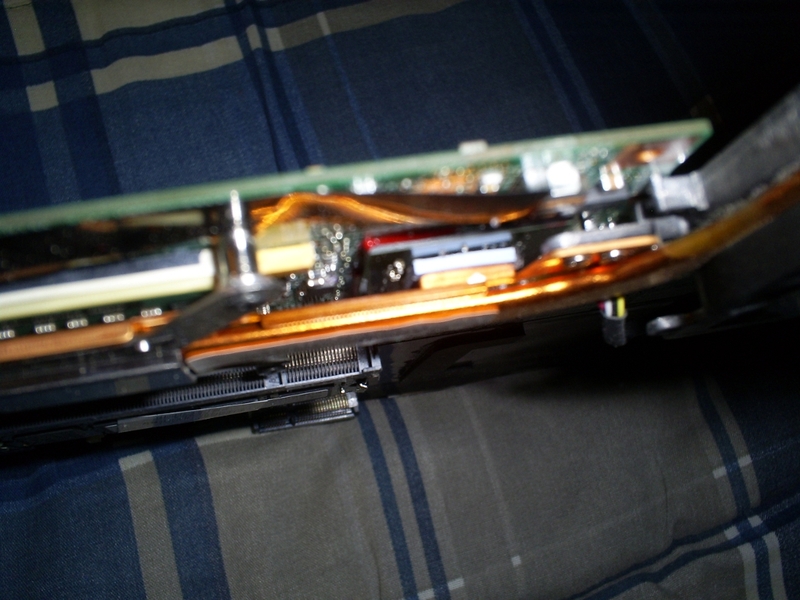 Here you can see the rubber pad between the GPU and the copper heat sink. It is blue, but the camera flash has washed it white, but you can see it's true color in the reflection on the GPU, making it look like there is a white one, and a blue one, but white is the pad, and the blue is the reflection of the pad. 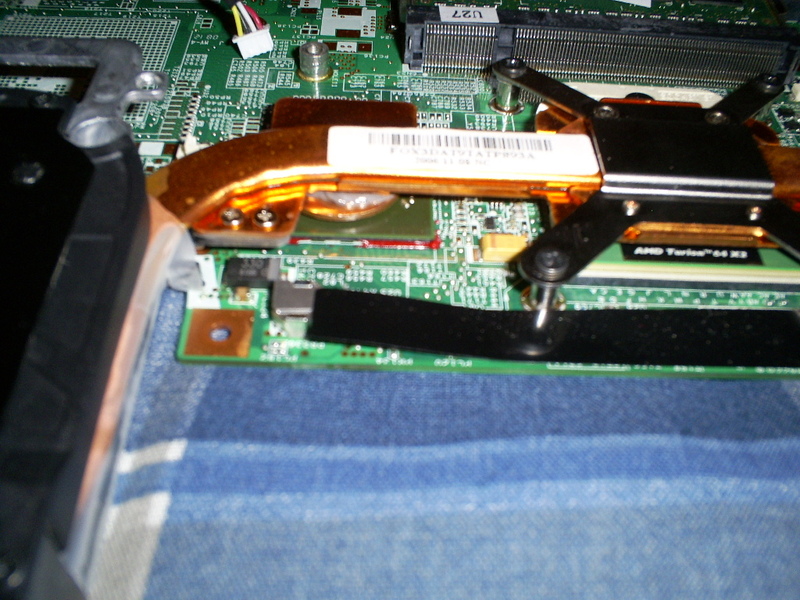 The rubber pad is a heat sink, and is being used to conduct the heat from the GPU to the heat sink, but it's not the best method of conducting heat, thus the penny trick is used instead. Another angle of the same thing. Notice the square coper piece that is welded to the coper pipe. And yet another picture of the same thing. 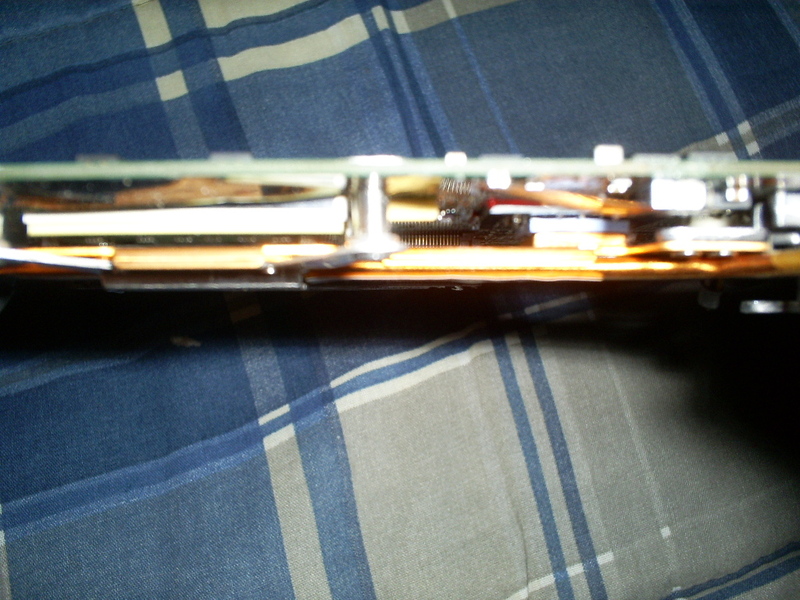 Here you can see the pink rubber pad/heat-sink on the left, then in the middle you can see the thin foil that they used for a heat sink for the CPU that is below it, then on the right the blue (looks white) pad for the GPU that is below it. Well now, this is embarrassing. Look at all that dust! 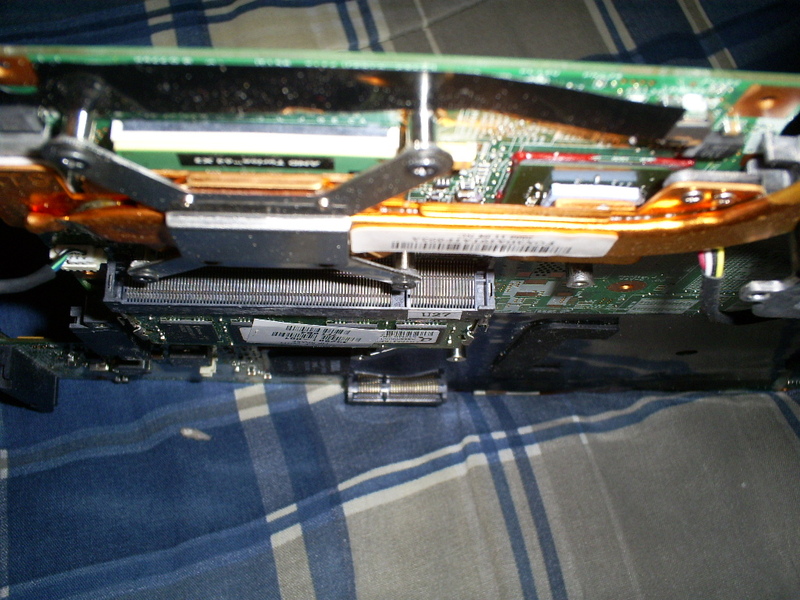 Hmmm wonder why it was not cooling very well. :-) Don't assume that the fan grill is clean on the inside just because it's clean on the outside. One penny ready for use. 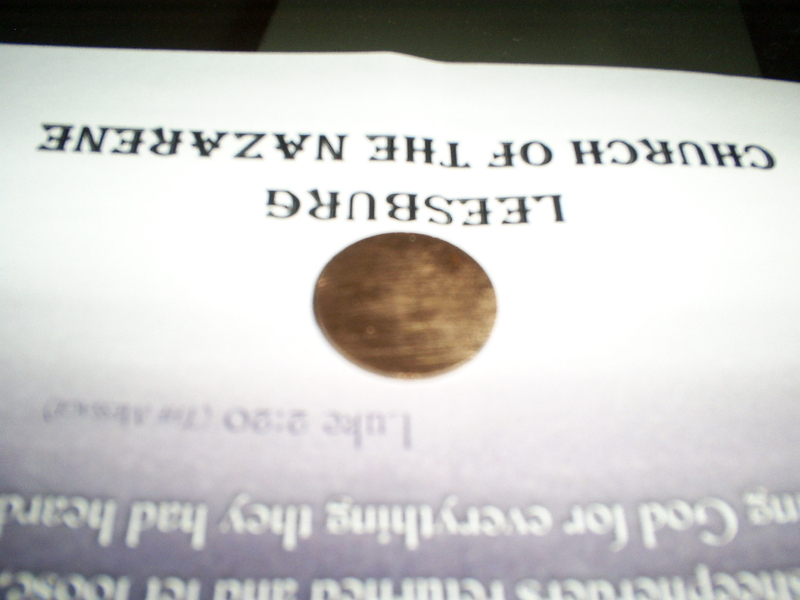 Be sure to get an older penny that is all copper. Some people just use the penny as it is, but I recommend that you file it down real smooth, and use a penny dated before 1982 so that it has the higher percentage of copper. Be sure that you do it evenly so that it is smooth and flat, not tapered. And yes filing it down carefully keeping it perfect is very time consuming, but worth it. You could also find a source of copper that would be fitting. 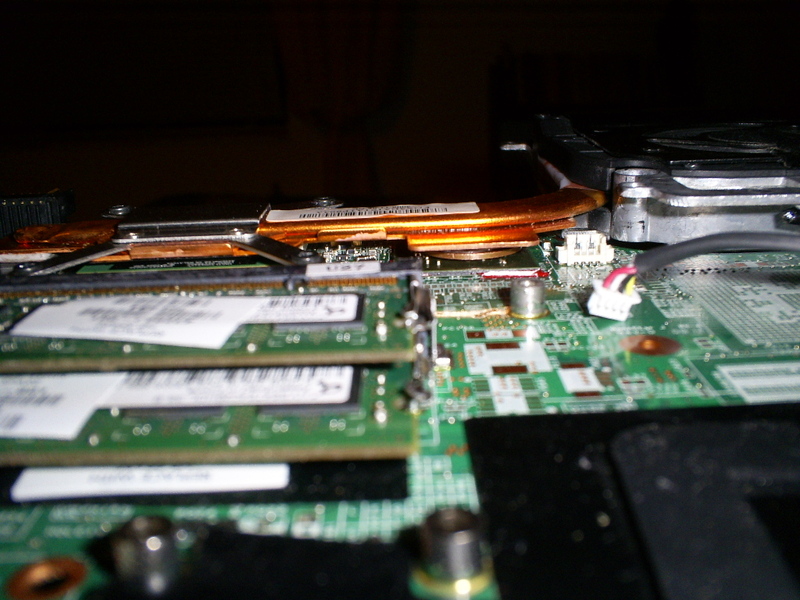 I put heat sink grease on the GPU, and then put the penny on it, and also put heat sink greas on the CPU, and other contact places. I went ahead and reused the pink rubber pad. 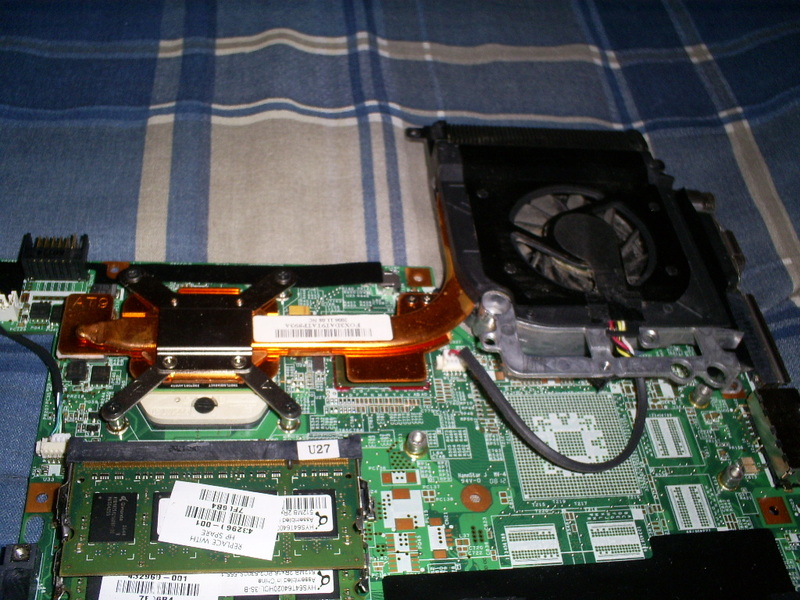 I also removed the silly foil heat sink that was used for the CPU. 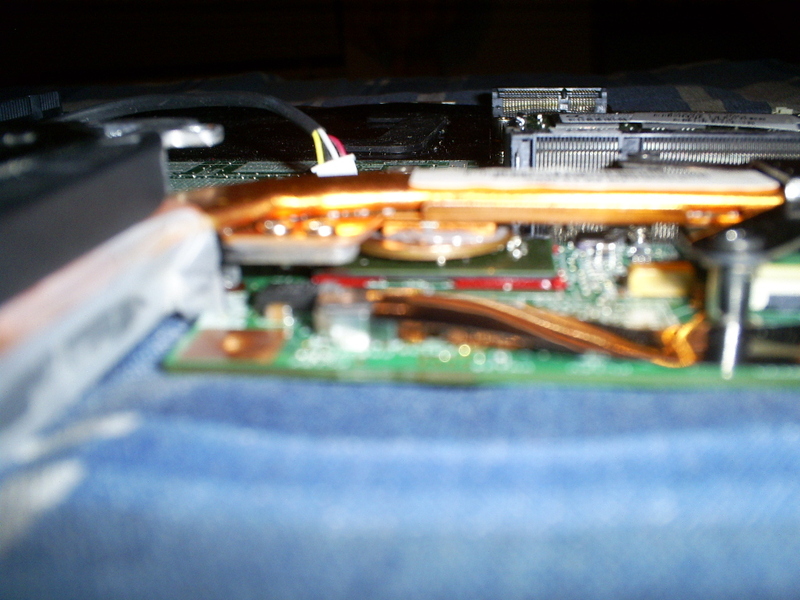 I put it back together, and you can see the penny sanwiched in. Don't forget to plug the fan back in. Another picture of the penny sanwiched in. And yet another picture of the penny sanwiched in. The GPU runs much cooler now. I could have spent more time getting better pictures, but I was in a hurry to get the computer back up and running.